Full disclosure: This isn’t my recipe. I convinced my husband to tell me all his secrets about the uh-maaazing butter pecan ice cream he makes regularly! And even now that I have the recipe and could make it myself, hubs still takes the responsibility on himself. Aren’t I a lucky girl? But lucky for all of us, you can find the easy recipe right here! This butter pecan ice cream recipe is allergen-friendly and uses no eggs. It’s also paleo with keto/low-carb and vegan options. Once you taste this recipe, you’ll never want to try another ice cream recipe again! I’ve also heard that satisfies pregnancy cravings, but I have yet to test that one out. Either way, this is one recipe you’ll definitely want to save for later! Why homemade? Most store-bought butter pecan ice cream includes tons of sugar (and corn syrup) and unhealthy processed ingredients, including thickeners, preservatives, and fake coloring! By making your own homemade butter pecan ice cream, you can avoid all the nasty fake ingredients and reduce the sugar while still making something that tastes just as good, if not better! For real, once you try making your own homemade, real, unprocessed, preservative-free food, it’s really hard to go back to the conventional stuff. You can actually taste the chemicals! There’s no going back after this recipe. 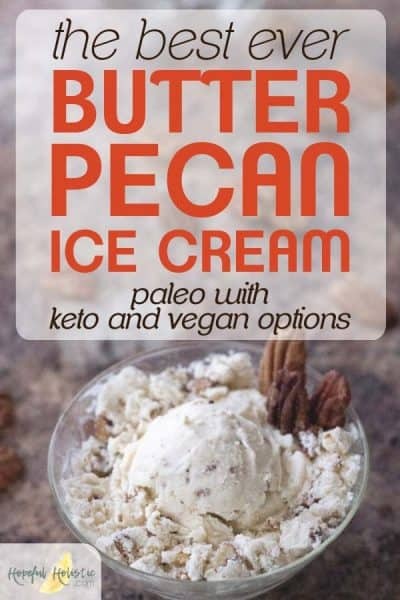 Even if you bought a sugar-free, “all-natural” version of butter pecan ice cream at the store, it probably has either fillers, added flavors, or carcinogenic artificial sweeteners in it! Any sort of thickener, stabilizer, or filler (including guar gum, xanthan gum, locust bean gum, and carrageenan) can be really tough on your gut and disruptive to your digestion. You can learn more about gums and other “natural” additives here. It’s really hard to find foods in the store that are meant to be thick but “healthy”, like almond milk, that don’t have fillers! Even “natural flavors” can be made using some icky processes and ingredients that you wouldn’t want to ingest. Plus, it’s probably costly if it’s marketing as being “healthy”. And still not that great for you! That’s why it’s a great choice to make your own food as often as possible. You can easily save money and stick to ingredients you can trust by making your own homemade butter pecan ice cream! 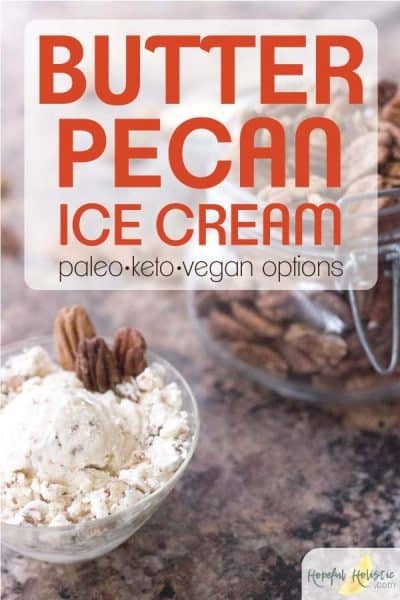 Read on to find out how to make your own paleo, vegan, or keto butter pecan ice cream with ingredients that really are all-natural and good for you! What is butter pecan ice cream made up? Love and deliciousness. Seriously, take a bite and tell me I’m lying! Ok ok, there might be a couple more ingredients. The ingredients for this easy butter pecan ice cream are flexible depending on your dietary needs. The base recipe calls for heavy cream, coconut milk, maple syrup, coconut oil, and pecans. There are no eggs, no white sugar, no caffeine, no processed ingredients, and no gluten (obvs). Just simple, real ingredients. This is a treat you can enjoy guilt-free! It’s best to use both heavy cream and coconut milk because it’s the creamiest combination- or so says my husband, recipe creator extraordinaire. But you can do it with just heavy cream or just coconut milk if you want! I like this canned coconut milk best- it doesn’t have any fillers like guar gum, which can be tough on your gut and digestion! Here are some ingredient substitutes you can make for dietary restrictions, without sacrificing any flavor or deliciousness! For keto: If you’re following a keto or low-carb diet, simply replace the maple syrup with 3 TBS xylitol and about 15 drops of stevia. Adjust to your desired sweetness! To make the pecans, simply toast them without the maple syrup. 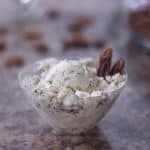 If you’re making keto butter pecan ice cream the pecans will be less sweet, but they’ll soak up the sweetness from the ice cream. For vegan: If you aren’t eating animal products, all you need to do is replace the heavy cream with coconut milk. You’ll use about two cans total. Maple walnut: Not a fan of pecans or want to try something different? No problem! 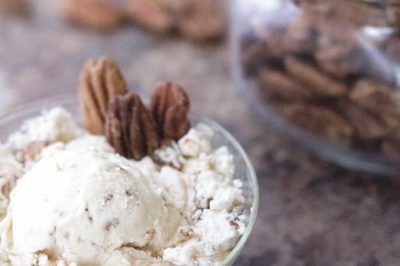 The pecans can easily be swapped with walnuts for a yummy maple walnut ice cream! If you’re looking for a good ice cream maker, I recommend the Cuisinart 1.5 Quart Frozen Yogurt / Ice Cream Maker. It doesn’t require ice and makes creamy ice cream, quickly and easily! This recipe makes a creamy, caramelized, old-fashioned butter pecan ice cream that the whole family can enjoy. If you have dietary restrictions, make sure to check the substitutes above to help create a diet-friendly treat! Try this easy recipe and you'll never want store-bought ice cream again! This healthy and easy butter pecan ice cream is utterly delicious. It's free of refined sugars and eggs, and it's paleo with vegan and keto options. Heat heavy cream, coconut milk, and 1/4 cup maple syrup in a medium saucepan on medium-high heat until boiling. Melt coconut oil in a small skillet, add pecans, drizzle over 2 tbs of maple syrup, and stir. Put pecans in the oven for 15-20 minutes, stirring occasionally, until fragrant and slightly browned. After simmering, put the cream mixture into the fridge for 8 hours or overnight, or (if you're impatient like me) put it in the freezer for about 2 hours, stirring occasionally. Transfer cream to an ice cream mixture and turn on until it reaches the desired consistency. Mix in pecans and enjoy! Eat immediately for a soft-serve ice cream. Store in the freezer, and thaw on the counter for 15-20 minutes before serving. Total time does not reflect wait time, or time the mixture is in the fridge, freezer, or ice cream maker- the total time to make this recipe should be about 3 to 9 hours. I hope you enjoy this ice cream recipe! I think it’s the best butter pecan ice cream ever, but I might be a tad biased 😉 My favorite part is the caramelized pecans- they’re a bit addictive! Need more healthy, yummy, sugar-free recipes to try? Like it? Save this recipe for later and share it on Pinterest!